The design of this box is so pretty, isn’t it? The info card for this box has a designed quote on it. It’s sort of the weight and size of a postcard. You could frame this card and use it as a piece of art in your home if you wanted. And the quote is from the book in the box, which is cool! On the other side of the card, there’s a list of dates when the box will be holding discussions on their Instagram and Facebook pages. The book this month is a story of family and forgiveness. The story has the heartwarming, engrossing tone of a weekend afternoon movie. It’s a little sappy but very sweet. It brought a little-lighthearted sunshine to my cold winter. In the Light of the Garden is a novel about unearthed family secrets, the enchantment of past loves, and the indelible power of forgiveness. The first package is so big, it filled the whole base of the box. Brass Key – Value $1.00? What a stunning way to start out this box! This bag would easily work with formal or casual looks. It’s not real leather and sure, it could be higher quality, but I’m actually delighted by how unexpectedly nice this accessory is! This is an awesome accessory for my collection, and it came from… a book box! Who knew? This purse features a gold chain and a magnetic closure. The laser-cut white faux leather lays on top of a layer of metallic gold so that the gold twinkles through the doily-like designs. The bag is lined and has a little-zippered pocket. Inside, there was a brass key—that correlates to the story, but I’ll let you figure out how! Velvety Bag of Bentonite Clay – Value $2.00? There’s a little scoop of bentonite clay! At first, I was like, wait what? Which is funny, because the protagonist has the same reaction while looking into a similar bag of dust. This bag also has a small note inside it, which mirrors what’s in the bag in the book. Luckily, the box explains itself with this card. Bentonite clay is a powerful, natural ingredient found in many fancy facial products. Here, I have a recipe to bring the spa to my own home! Thank goodness. I’m always bummed when I get items in boxes that I can’t use, or which are just props. I was worried I was holding a random bag of sand, when in fact, I have several rounds of pampering ahead of me! The mask was thinner than I expected going on, but I liked that it was nice and cool. You could feel it tighten on your skin as it dried, which I took as it absorbing all the bad stuff out of my pores (I hope that’s true!). I think the real work happened when I rinsed it off. Massaging it away with warm water left my skin feeling smooth and soft. There’s even a tree design on the back of the recipe card. Again, this could make a cute addition to your decor, if you present it nicely. The next item is a lemongrass-green bento box with white polka dots on the lid. There aren’t any markings on the plastic to let you know whether it’s dishwasher/microwave safe, so I’ll assume it’s not. The plastic is a bit lightweight, but it snaps together solidly. The other great thing about this item is how there are lots of different compartments that you can include or remove. If you have a big salad, you can take the white trays out. If you have a sandwich and some snacks, too, you can use the white trays to stow the smaller servings. There’s also a business-card-sized photograph in the bento box. Again, this makes sense in the story, don’t worry! Here’s the final gift! Let’s see what it is. Flat-Handled Striped Umbrella – Value $11.96? I couldn’t find this exact umbrella online, so I linked to something similar. I was just talking about how I needed a new umbrella, and this one is perfect! It’s so small (maybe about 6 inches long when collapsed) that it fits easily into my tote bag (it could probably fit inside that envelope clutch just fine, actually). I like that it comes with a matching sleeve, too. Because it starts out tiny, I wasn’t surprised that this umbrella is on the smaller side when open, too. It’s enough to shield my shoulders, but it might not be enough for a heavy rain. 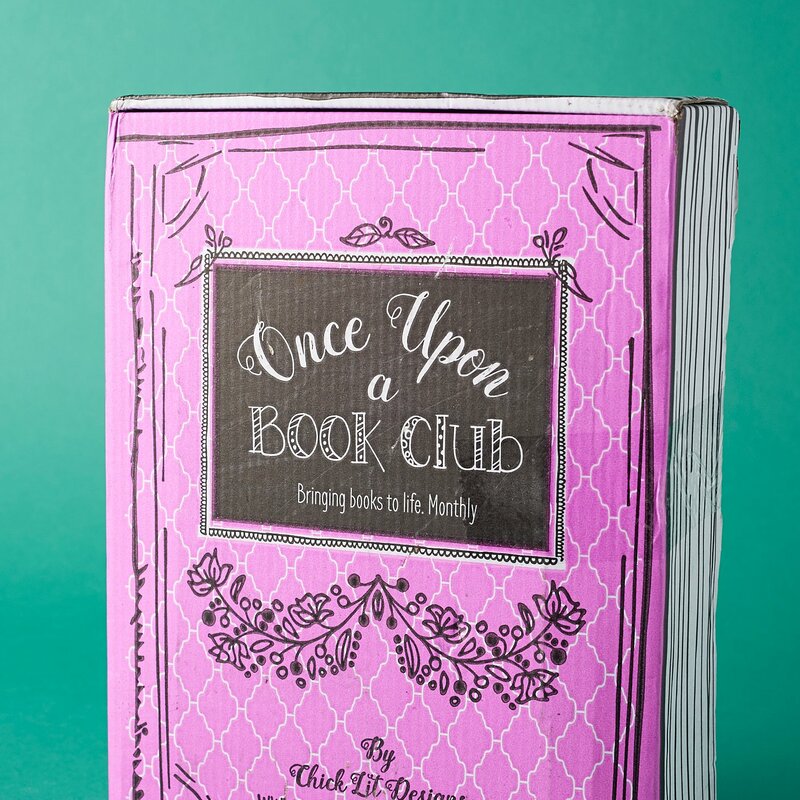 Verdict: This was my favorite Once Upon a Book Club box yet! In addition to bringing the story to life, each item had a useful application in real life. In the past, items in the box have leaned towards feeling like props, which would be interesting to see and open, but wouldn’t have lasting value—and that made the box feel less true to the $34.99 price. In this case, however, the items were fun and functional! And there’s about $38.00 of value inside this box. The best part, of course, is that the book was really sweet and enjoyable to read. What neat ideas! Love the concepts and items they included. I think this is the best Once Upon a Box they created. Functional items that go beyond the book itself. I hope future boxes are as good! This box looks so amazing! Very very cute idea and I think its so special and whimsical. Unfortunately I’m kind of picky with my reads so, worried I just wouldn’t be too fond of the book choices. Looks like a great sub though! Awesome review of what looks like an awesome box. Going to have to watch this one. I really really like this, but I think it’s to much money, for me anyway. I love sappy books so I’m sure I’d like that book. Rest of the box looks great to me too. I spent forever on deciding what my next subscription box should be (prepaid),and I knew that as soon as I decided then the best one(for me)-THIS one, would appear. Oh,well,maybe in 6 months.